A new classroom trailer sits in the parking lot of General Rosecrans Elementary School on July 6. The trailer was going to be anchored on the basketball court to save costs. Classroom trailers and Chromebooks are two tools the Big Walnut School District will rely on for the 2017-18 school year. The 109-square-mile district, entirely within Delaware County, but containing two villages and parts of six townships, has an enrollment of about 3,660 students and continues to grow at a rate of more than 100 students each summer. To meet the overcrowding in the buildings, a bond issue will be on the November 7 ballot, which, if passed, would increase the district from seven buildings to nine. For the time being, classroom trailers are being used at the most overcrowded schools, such as one that will go in at one of General Rosecrans Elementary’s basketball courts. In addition, the trailer at Big Walnut Elementary is being renovated, and will have two preschool units. Because the district is growing, there will be more staff needed to serve the kids (including a new principal at Souders elementary), and Pollock said she doesn’t like seeing money being diverted to the trailers. As for technology, every 5th- through 12th-grader this year will have a Chromebook. Last year, the laptop computers were used by Big Walnut High School students. The district’s Board of Education recently approved expanding Chromebook use for the 5th- through 8th-grades. Chromebooks are also used a lot for assessments. Instead of a pencil-and-paper test that would take the teacher a while to grade and then get the data, the teacher can find out quickly if they need to go back over a subject or if the students understand the lesson. Each student will be assigned their own Chromebook, as opposed to being shared. The school board was told that by being responsible for their own device, there were fewer equipment problems. “Teaching them when it’s appropriate to use, that’s a life skill,” Pollock said. All-day Kindergarten is continuing to grow in the buildings, she said. About 80 percent of incoming students are now opting for the all-day program. In addition to tangible tools, the district is continuing to teach in a way that meets future needs. The transition is to move away from teaching just the facts to communicating better. 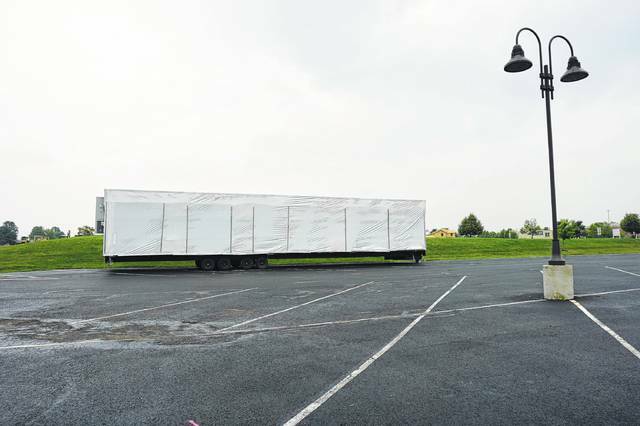 The first day of school is Wednesday, Aug. 16.
https://www.delgazette.com/wp-content/uploads/sites/40/2017/07/web1_DSC00395.jpgA new classroom trailer sits in the parking lot of General Rosecrans Elementary School on July 6. The trailer was going to be anchored on the basketball court to save costs. This entry was tagged Big Walnut; education; Angie Pollock. Bookmark the permalink.